Rafa is a super friendly and huggy guy who loves to be near his people. He is a bundle of fun, loves to play and is guaranteed to make you laugh at least once a day. He’s a go-with-the-flow kind of guy who makes friends with new dogs easily. He’s smart, adventurous and curious, exploring the world around him. He is good on a leash and is pretty much house trained. Rafa prefers a quiet home in terms of noise, but doesn’t mind lots of family activity going on. He prefers hanging with his humans over toys right now but that may change as he adjusts to his new home and this super cold weather. Rafa passed his cat test, showing little interest. His ideal home is one with a yard and a family who has lots of time to spend with him. Rafa would also be very happy to live with a dog pal. 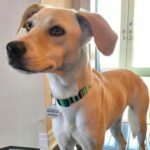 If you are interested in Rafa please apply at www.dibsrescue.com. Families with children should review the information on Kids and Dogs on the DIBS website before applying (https://dibsrescue.com/kids-dogs/).